Introducing AROMA-FUSION, A New Concept for Body Care by YON-KA Paris. Download to Win a FREE AROMA-FUSION Gift Basket. 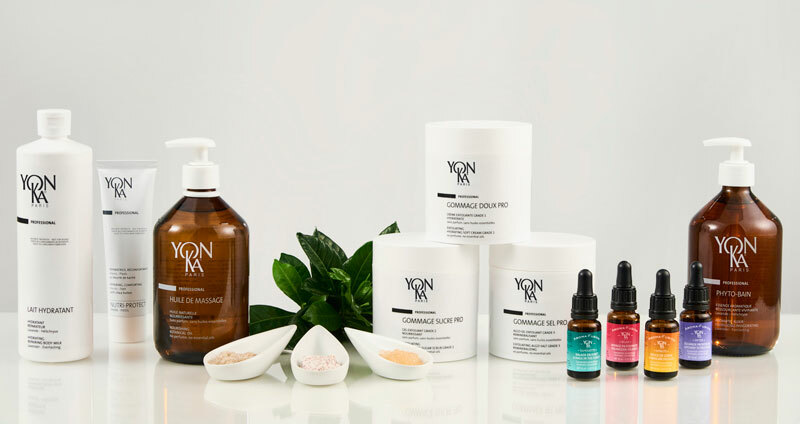 AROMA-FUSION, Yon-Ka’s newest launch features an exclusive and ultra-customized collection of body products, both retail and professional, along with treatments designed to create a phyto-aromatic journey with proven efficacy and specific benefits. Yon-Ka selected four regions of France and their overseas territories, filled with unique natural wealth to create four sensory journeys corresponding to four beauty goals. These iconic regions include: Getaway To Provence/Detox, A Walk In The Forest/Silhouette, Corsican Delight/Vitality, and Polynesian Journey/Relax. 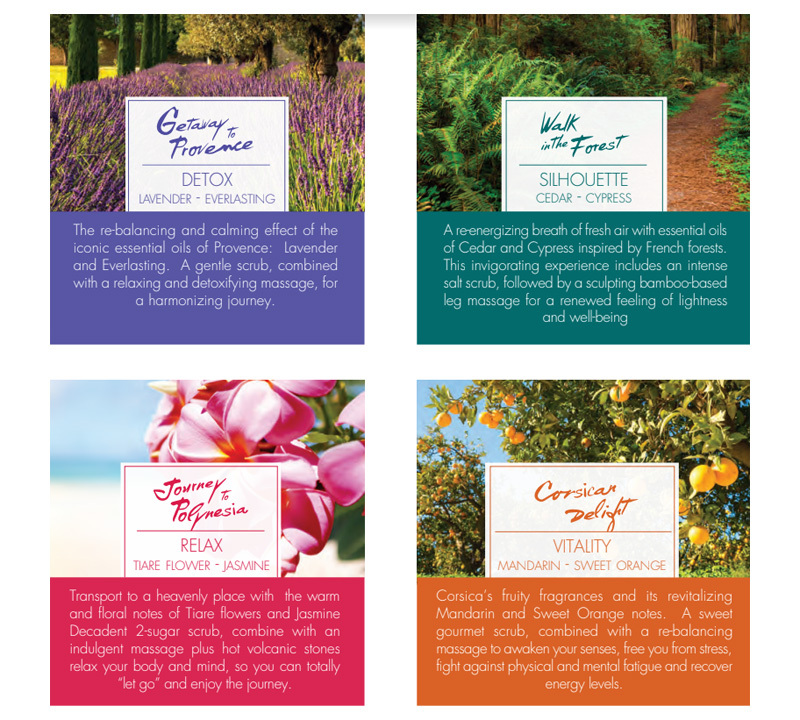 The essences chosen for each region represent the unique olfactory fingerprint that instantly transports the spa-goer to their destination along with their potent ability to address concerns. Each region/goal’s concentrate is color coordinated with the retail collection making it easy for the spa technician to help their clients in selecting the products to extend their spa experience and enhance their treatment results. AROMA-FUSION offers a uniquely customized treatment experience as well, allows the spa-goer to choose according to the aromatic world they wish to experience or their unique beauty goal. Once the customer has chosen their aromatic concentrate, the spa technician uses the blend to customize a choice of three scrubs or one massage oil. The scrub services range in intensity from the gentle Gommage Doucer, the intermediate Gommage Gormand, and the intensive Gommage Marin. These three new scrub offerings with different granules and exfoliating intensities feature ingredients such as bamboo, apricot kernel powder, brown and white sugars and marine salt for exfoliation. Four specialized massage techniques were developed to showcase Yon-Ka’s expertise, using an all-natural, unscented massage oil, which is then personalized with the concentrate of choice. Aroma-Luxe, a full body manual massage experience utilizing relaxing, draining and energizing techniques. Aroma-Sculptant, a toning massage with bamboo that focuses on the legs for a sensation of lightness. Aroma-Relax with warm volcanic stones, eases muscle tension on the back. Finally, Aroma-Energy for the hands and feet uses acupressure to remove energy blockages and relieve stress. Four Escapes were created combining complimentary scrubs and massage treatments. These 90-minute personalized experiences include full body exfoliation, massage and specialized body techniques, all combined with aromatic essential oil blends to take the spa-goer on a journey. The customer can choose their escape based on the iconic region in France it represents, like Getaway To Provence or the treatments’ action, like Detox. AROMA-FUSION’s retail collection extends the spa results with the four aromatic universes, four beauty goals and nine products with results oriented, sensory and olfactory formulas. DETOX with essential oils of lavender and everlasting perfectly cleanses the skin, protecting it from daily stress. This collection includes Phyto Bain, a bath essence to drain and tone. Lait Hydratant, a fragrant body milk to hydrate and replenish. Huile Detox, a light nourishing body oil with detoxifying action. Gommage Doux, a cream scrub with bamboo and apricot kernel powder to exfoliate along with mango butter and sesame oil to nourish. SILHOUETTE has a toning and invigorating action with cypress, cedar and rosemary essences known for their liposvelt properties to contour the figure. Featuring Huile Silhoutte, a fine, light oil to soften and smooth the skin effortlessly. VITALITY features citrus essential oils such as mandarin and sweet orange to impart an energy boosting and de-stressing action, includes Crème Mains, an ultra-comforting cream to repair and protect hands and cuticles, along with Gommage Sucre, a body scrub with both brown and white sugar to gently exfoliate and sunflower to nourish. RELAX with jasmine and tiaré flowers for a well-deserved break from a busy world. Huile Délicieuse, a light oil spray nourishes the skin and hair with sunflower, sesame and baobab. Gommage Sucre exfoliates and softens with brown and white sugars and sunflower oil. In this hectic world where harmony has become a luxury, allowing the body and mind to come together as one is a priority. Yon-Ka Paris believes that efficacy and well-being are inseparable, and that effectiveness seamlessly blends with sensory appeal. Complete with our unique Signature Introduction and Conclusion the exfoliation technique demonstrated here adapts to three intensity grades of Scrubs from YON-KA Paris. Level 1 is gentle and well-suited for sensitive skin (GOMMAGE DOUX PRO). Medium intensity is obtained using the GOMMAGE SUCRE PRO, which transforms from granules to a skin enriching milky texture. Robust exfoliation is achieved using the mineral-rich GOMMAGE SEL (salt) PRO. Both resilient and durable mineral rich bamboo has been featured in traditional Chinese medicine for 2,000 years. In this video, the sculpting and lifting techniques are performed to front and back of the legs. For a complete silhouette enhancing massage experience, combine with our AROMA-LUXE BODY MASSAGE.